I just installed urlfilter unfortunately some users are recreated popularity site NSFW, the problem is not to “entertain” with this type of site, but sometimes these places up dirt half of computers and then to clear it we have to invest a good time running antivirus and AntiSpyware. But, the detail is applied to all the locks on network users. What if I want to leave a machine without locks?. So, we have to resort to give permission by IP addresses, is not the only solution but is very easy to implement. Based on the urlfilter squidGuard, the documentation of this project can be applied practically without problems. This is the file we have to change. I am still awaiting a change that if I lost my web changes so you have this in mind. 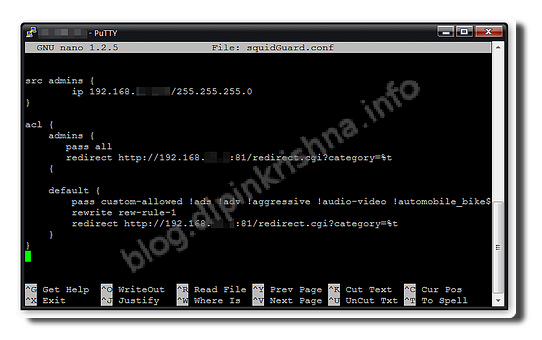 The documentation of squidGuard finding rules based on source IP addresses that helped guide me to make my changes. where 192.168.0.x is the IP to which I shall give him permission. That way everyone would have an internet filter, less they appear in the list of admins. Same can be refined a lot more options to administrators, but that will be later.